Want to make homemade Tomato Sauce, Applesauce or Baby Food to eliminate additives and preservatives, but hate the thought of all that messy peeling and seeding? This fruit and vegetable strainer will do it for you! Use either the suction-cup base or C-clamp to mount to tabletop (dual-mounting system is patent pending). 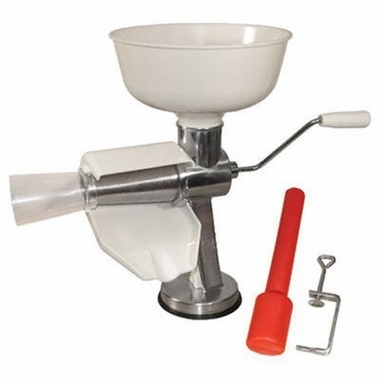 Easy-turn handle for effortless use - seeds and skin separate from the puree. Upgrade to the Deluxe: *4-Piece accessory kit includes stainless steel berry screen; salsa screen; pumpkin/squash screen; and plastic grape spiral. Additional Accessories: Electric motor connects easily to the Roma Food Strainer to shorten your processing time even more.